Foreign investors shifted to net buying position for the first time this year in March, joining a buying spree in the Korean debt market that has gained life recently on increasing bets on a cut in the policy rate due to deteriorating economic conditions at home and abroad and a pause in the global monetary tightening trend. According to the Bank of Korea, foreign capital in Korean bonds made a net inflow of $1.31 billion in March as foreigners turned into net debt buyers for the first time in three months after taking out a net $3.23 billion in January and $190 million in February from Korean debt. Volatility in the equity assets has increased amid growing downside risks to the economy, shifting investors’ attention to safer debt assets. Investors also expect debt prices to go higher if interest rates go down, the central bank said. Despite repeated denials from the central bank governor, the debt market in Korea has been betting on a rate cut in near future. Foreign capital inflow for stock purchase recorded a net $20 million in March, the smallest amount in four months. In December, they bought $130 million worth of Korean shares, $3.34 billion in January, and $1.51 billion in February. In April they turned back to strong buyers. The Korean currency fell against the U.S. dollar as of Monday on reduced exports and heavy dividend payment to foreigners who exchanged Korean won assets into dollars. On Monday, the Korean won closed at 1,144.7 against the U.S. dollar, losing 9.6 won from closing on March 29 at 1,135.1. 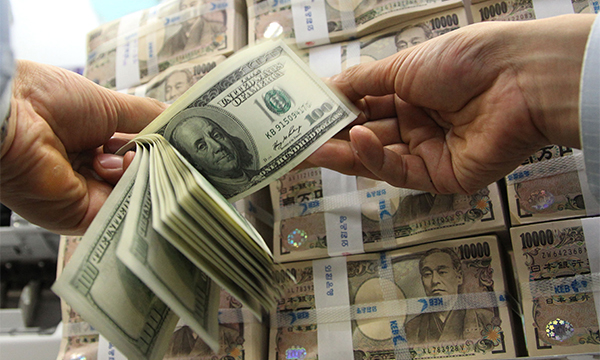 The currency also fell against Japanese yen, closing at 1,027.3 won per 100 yen, and 170.28 won per Chinese yuan. Korea’s default risk, meanwhile, remained at pre-crisis level. The premium credit default swap (CDS) for Korea’s benchmark five-year foreign exchange stabilization bonds averaged 30 basis points last month, down 1 basis point from a month ago. Data showed foreign exchange dealing by local banks reached a total $26.27 billion on daily average in the first three months of this year, up $2.47 billion from the previous three months. Forward exchange purchases by local enterprises amounted to $1.7 billion, down $7.5 billion during the same period. Total transactions reached $40.1 billion in the first quarter ended March, down $7.3 billion from the previous quarter ended December.